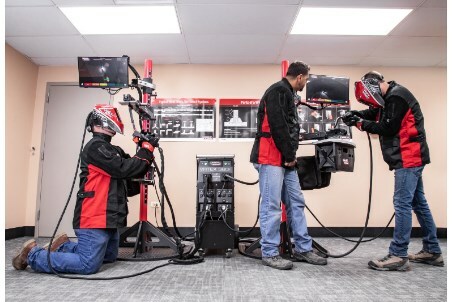 Lincoln Electric® has launched new VRTEX® virtual reality welding training simulators to provide a powerful, cutting-edge solution for training welders faster and more efficiently while driving down material costs. With superior graphics and accurate sounds, the VRAW™ (Virtual Reality Arc Welding) experience offered by VRTEX simulators transfers seamlessly into real-world, hands-on welding training. The next generation VRTEX welding systems feature an extremely realistic GTAW (TIG) welding experience. The weld puddle, including weld discontinuities, is highly accurate and visually and audibly responsive to operator behaviour. The operator uses an adaptive current foot control and can perform welds without and without filler metal on a variety of materials. The new VRTEX 360+ allows schools or training centres to train two welders at the same time from one machine, each independently performing welds using different processes, coupons, joints and Welding Procedure Specifications (WPS). Safety – no metal, sparks, heat, gas or fumes. Immediate performance evaluation and enhanced student engagement. Demo and Replay Modes – used by instructors to display optimal welding techniques and review actual student behaviour. Virtual Bend Tests: instantly provides results to reveal what causes a weld to pass or fail. Advanced scoring for weld tie-ins. Pipe-on-Plate coupon and welding procedure specifications. Lap coupon with support for mild steel, aluminum and stainless steel. Weldometer™ records material savings for each practice weld performed.